Communication DNA uncovers clients’ communication styles and informs financial advisors how they wish to be communicated with by others. This is powerful information for you to know in building greater connection and trust with your clients. 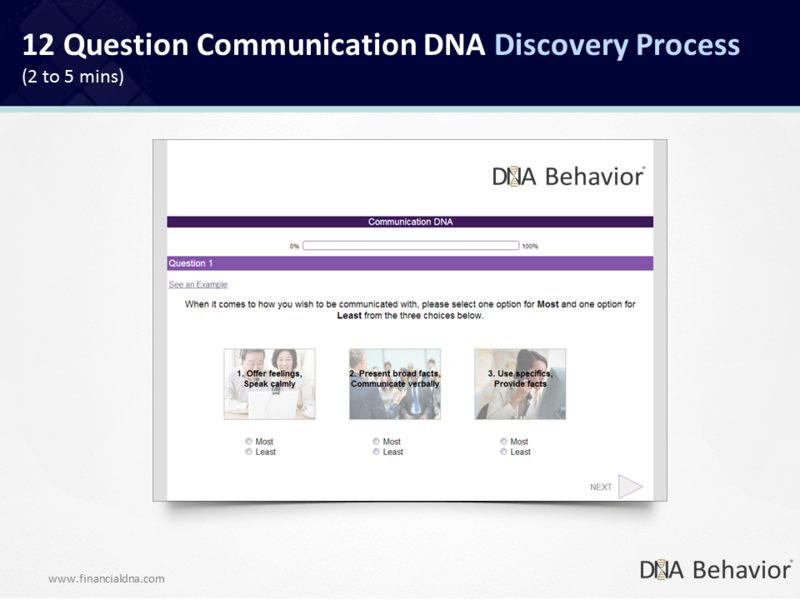 The Communication DNA Discovery Process is a fun and engaging online questionnaire completed by clients to identify their communication styles. 1) Clients spend only 2 to 5 minutes to complete a 12-question Discovery Process accessible on a financial advisor’s website. 2)Based on the client’s responses, their unique communication style and insights are identified. 3) Clients are then segmented into 1 of 4 primary Communication Styles. The segmentation and the steps to customize interactions with clients are immediately available for financial advisors and their teams. Communication DNA’s 12 question process take only 2-5 minutes to complete. Research shows that advisory teams and service teams will only naturally engage 40% of clients or customers. Uncovering which style advisors are and then matching them to the clients they naturally engage which helps teams close the “Relationship Gap” with the other 60%. 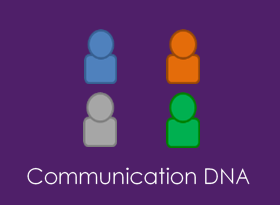 Communication DNA reports tell advisory teams how to modify their natural communication styles to create the ideal environment for their clients. 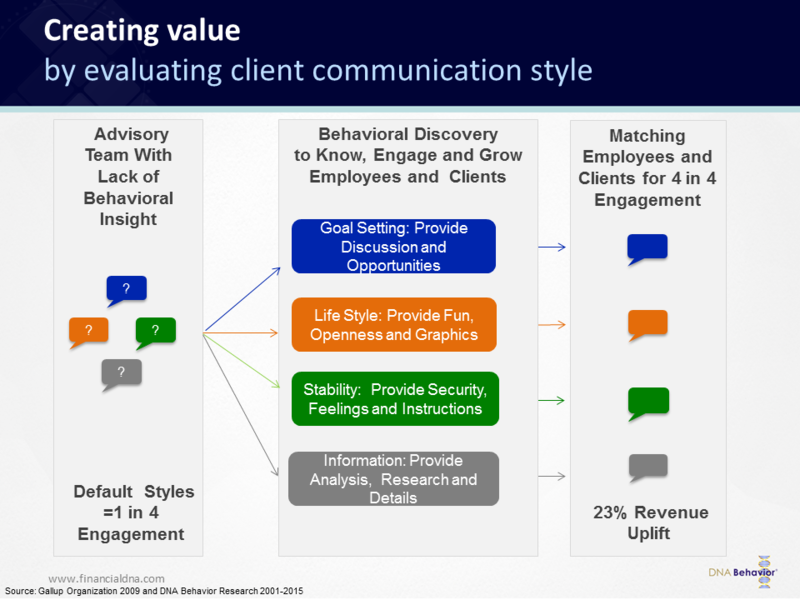 The above diagram shows how financial services firms can increase revenue by aligning advisors to clients with a similar communication style. 1) A customized Consumer Report is immediately available for clients participating in the process. This report includes clients’ communication keys, communication strengths and a basic introduction to the other 4 styles. 2) The financial advisor or firm providing the process has access to a series of reports which provide more in-depth insights in a range of areas so that an enhanced business relationship can be developed. Communication DNA integrated into Salesforce allows validated behavioral intelligence to be operationalized at the fingertips of financial advisors and their teams to deepen engagement in every client interaction. The Communication DNA App for Salesforce facilitates the communications between the Financial DNA platform and advisor’s Salesforce account. During this process, the Communication DNA App matches records between the two sources. When client records from the Communication DNA platform match Contacts and Leads within a Salesforce account, the key behavioral insights along with 5 report links are provided within the Contact and Lead page layouts.